Herpes encephalitis is the most common cause of sporadic viral encephalitis, with a predilection for the temporal lobes and a range of clinical presentations, from aseptic meningitis and fever to a severe rapidly progressive form involving altered consciousness. In adults, herpes simplex virus type 1 (HSV-1) accounts for 95% of all fatal cases of sporadic encephalitis and usually results from reactivation of the latent virus. The clinical findings and neuroimaging appearance are both consistent with spread of the virus from a previously infected ganglion. More recently, sporadic cases of human herpesvirus 6 (HHV6) have been described in immunocompromised patients or those with lymphoproliferative disorders. In children and neonates, herpes simplex virus type 2 (HSV-2) accounts for 80-90% of neonatal and almost all congenital infections. An isolated case report of an immunocompromised adult patient developing HSV-2 infection has been described. Magnetic resonance imaging (MRI) can play an important role in determining the diagnosis and extent of disease. [1, 2, 3, 4, 5, 6, 7, 8, 9, 10, 11, 12] See the image below. 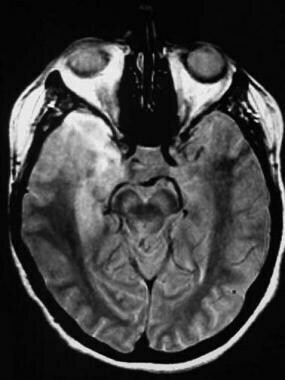 Magnetic resonance image depicting herpes encephalitis. On pathology, herpes viruses cause a fulminant hemorrhagic and necrotizing meningoencephalitis, with typical gross findings of severe edema and massive tissue necrosis, with petechial hemorrhages and hemorrhagic necrosis. Often, the petechial hemorrhage is not observed on computed tomography (CT) scanning or MRI. On microscopy, a focal necrotizing vasculitis is observed with perivascular and meningeal lymphocytic infiltration and eosinophilic intranuclear inclusions in glial cells and neurons. Taira et al found that a lower Glasgow Coma Scale score and a greater number of lesions detected on CT scanning were predictors of prolonged acyclovir therapy  (see the Glasgow Coma Scale calculator). Early imaging with CT scanning or radionuclide studies may also reveal normal findings. CT scanning may not reveal abnormalities until 3-5 days after symptom onset, by which time the patient may be stuporous and comatose. As noted above, in the acute setting, even contrast-enhanced MRIs may be negative. The herpes virus preferentially involves the temporal lobe and orbital surfaces of the frontal lobes. This involvement may extend to the insular cortex, posterior occipital cortex, and cerebral convexity; however, the basal ganglia are spared. Bilateral involvement is frequent. Involvement of the cingulate gyrus occurs later in the disease. The classic involvement of the medial temporal and frontal lobes is consistent with intracranial spread along the small meningeal branches of the fifth cranial nerve. Cingulate gyrus involvement may arise from efferent hippocampal connections. A rhomboencephalitis resulting from pontine involvement may occur and likely arises from retrograde viral transmission along the cisternal portion of the trigeminal nerve to the brainstem. Because of bone artifact, the temporal lobes can be difficult to assess on CT scanning. Early in the disease process, CT scanning may be normal. Other causes of encephalitis, tumor, or lymphoma may appear similar. The diagnosis of herpes encephalitis can be strongly suggested by the typical appearance of medial temporal abnormalities that do not respect hippocampal borders. In adults, T2-weighted MRI reveals hyperintensity corresponding to edematous changes in the temporal lobes (see the first 2 images below), inferior frontal lobes, and insula, with a predilection for the medial temporal lobes. Foci of hemorrhage occasionally can be observed on MRI (see the third image below). Axial proton density–weighted image in a 62-year-old woman with confusion and herpes encephalitis shows T2 hyperintensity involving the right temporal lobe. Axial gadolinium-enhanced T1-weighted image reveals enhancement of the right anterior temporal lobe and parahippocampal gyrus. At the right anterior temporal tip is a hypointense, crescentic region surrounded by enhancement consistent with a small epidural abscess. 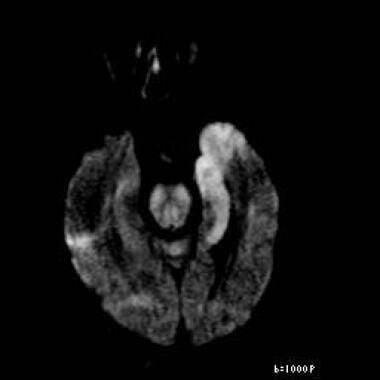 Axial nonenhanced T1-weighted image shows cortical hyperintensity (arrows) consistent with petechial hemorrhage. In general, this is a common pathologic finding but less commonly depicted in herpes encephalitis. Axial diffusion-weighted image reveals restricted diffusion in the left medial temporal lobe consistent with herpes encephalitis. This patient also had a positive result on polymerase chain reaction assay for herpes simplex virus, which is both sensitive and specific. In addition, the patient had periodic lateralized epileptiform discharges on electroencephalogram, which supports the diagnosis of herpes encephalitis. Coronal T2-weighted image reveals hyperintensity in the left temporal lobe (arrows) in a distribution similar to the restricted diffusion abnormality seen in the previous image. This finding is typical for herpes encephalitis. 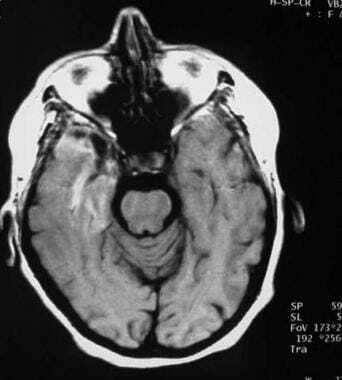 In patients with HHV6 infection, one series noted that in addition to mesial temporal lobe abnormality, abnormal T2 hyperintensity has been seen in the insular and inferior frontal region, which may suggest the diagnosis. There are felt to be 2 typical imaging appearances: one seen in older adults involves T2 hyperintensity confined to the medial temporal lobe; in young adults, a more varied pattern has been described that includes foci of restricted diffusion with an otherwise normal magnetic resonance, diffuse cortical necrosis, or small focal regions of abnormal T2 hyperintensity. Gadolinium-based contrast agents have been linked to the development of nephrogenic systemic fibrosis (NSF) or nephrogenic fibrosing dermopathy (NFD). For more information, see the Medscape Reference topic Nephrogenic Systemic Fibrosis. NSF/NFD has occurred in patients with moderate to end-stage renal disease after being given a gadolinium-based contrast agent to enhance MRI or MRA scans. For more information, see FDA Information on Gadolinium-Based Contrast Agents or Medscape. The role for ultrasonography in herpes encephalitis is limited. For in utero or neonatal evaluation, ultrasonography may have a limited role in identifying the periventricular destructive process. The use of technetium-99m (99m Tc) hexamethylpropyleneamine oxime (HMPAO) single-photon emission CT (SPECT) scanning in evaluating herpes encephalitis is limited. Results demonstrate that the encephalitis matches the distribution of hyperintensity on T2-weighted MRIs, with increased HMPAO uptake in the acute stage. Late sequelae are characterized by decreased HMPAO uptake and postnecrotic widening of the temporal horns. When abnormal uptake involves the temporal lobes, with characteristic involvement of the limbic system, the diagnosis of herpes encephalitis is likely. Grover D, Newsholme W, Brink N, Manji H, Miller R. Herpes simplex virus infection of the central nervous system in human immunodeficiency virus-type 1-infected patients. Int J STD AIDS. 2004 Sep. 15(9):597-600. [Medline]. 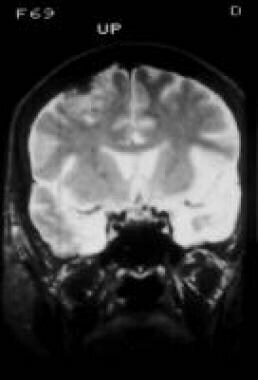 Harrison NA, MacDonald BK, Scott G, Kapoor R. Atypical herpes type 2 encephalitis associated with normal MRI imaging. J Neurol Neurosurg Psychiatry. 2003 Jul. 74(7):974-6. [Medline]. [Full Text]. Heiner L, Demaerel P. Diffusion-weighted MR imaging findings in a patient with herpes simplex encephalitis. Eur J Radiol. 2003 Mar. 45(3):195-8. [Medline]. Tyler KL. Herpes simplex virus infections of the central nervous system: encephalitis and meningitis, including Mollaret's. Herpes. 2004 Jun. 11 Suppl 2:57A-64A. [Medline]. Weaver S, Rosenblum MK, DeAngelis LM. Herpes varicella zoster encephalitis in immunocompromised patients. Neurology. 1999 Jan 1. 52(1):193-5. [Medline]. Elbers JM, Bitnun A, Richardson SE, et al. A 12-year prospective study of childhood herpes simplex encephalitis: is there a broader spectrum of disease?. Pediatrics. 2007 Feb. 119(2):e399-407. [Medline]. Engman ML, Adolfsson I, Lewensohn-Fuchs I, Forsgren M, Mosskin M, Malm G. Neuropsychologic outcomes in children with neonatal herpes encephalitis. Pediatr Neurol. 2008 Jun. 38(6):398-405. [Medline]. De Tiège X, Rozenberg F, Héron B. The spectrum of herpes simplex encephalitis in children. Eur J Paediatr Neurol. 2008 Mar. 12(2):72-81. [Medline]. Whitley RJ. Herpes simplex encephalitis: adolescents and adults. Antiviral Res. 2006 Sep. 71(2-3):141-8. [Medline]. Tyler KL. Update on herpes simplex encephalitis. Rev Neurol Dis. 2004 Fall. 1(4):169-78. [Medline]. Midi I, Tuncer N, Midi A, Mollahasanoglu A, Konya D, Sav A. Effects of decompressive surgery on prognosis and cognitive deficits in herpes simplex encephalitis. Behav Neurol. 2007. 18(4):245-9. [Medline]. Taira N, Kamei S, Morita A, et al. Predictors of a prolonged clinical course in adult patients with herpes simplex virus encephalitis. Intern Med. 2009. 48(2):89-94. [Medline]. Domingues RB, Fink MC, Tsanaclis AM, et al. Diagnosis of herpes simplex encephalitis by magnetic resonance imaging and polymerase chain reaction assay of cerebrospinal fluid. J Neurol Sci. 1998 May 7. 157(2):148-53. [Medline]. Gasecki AP, Steg RE. Correlation of early MRI with CT scan, EEG, and CSF: analyses in a case of biopsy-proven herpes simplex encephalitis. Eur Neurol. 1991. 31(6):372-5. [Medline]. 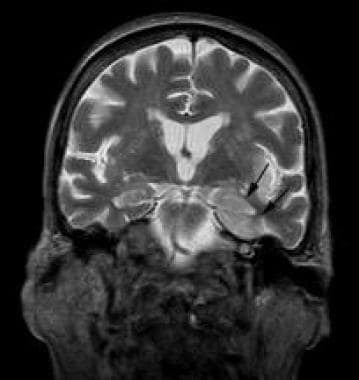 Kuker W, Nagele T, Schmidt F. Diffusion-weighted MRI in herpes simplex encephalitis: a report of three cases. Neuroradiology. 2004 Feb. 46(2):122-5. [Medline]. Vidwan G, Bryant KK, Puri V, Stover BH, Rabalais GP. 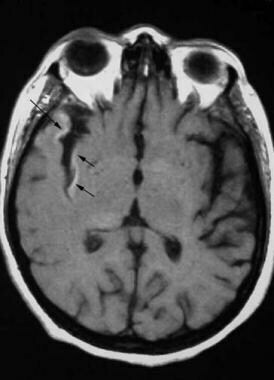 West Nile virus encephalitis in a child with left-side weakness. Clin Infect Dis. 2003 Sep 15. 37(6):e91-4. [Medline]. Zimmerman RD, Russell EJ, Leeds NE, Kaufman D. CT in the early diagnosis of herpes simplex encephalitis. AJR Am J Roentgenol. 1980 Jan. 134(1):61-6. [Medline]. Benator RM, Magill HL, Gerald B, Igarashi M, Fitch SJ. Herpes simplex encephalitis: CT findings in the neonate and young infant. AJNR Am J Neuroradiol. 1985 Jul-Aug. 6(4):539-43. [Medline]. Herman TE, Cleveland RH, Kushner DC, Taveras JM. CT of neonatal herpes encephalitis. AJNR Am J Neuroradiol. 1985 Sep-Oct. 6(5):773-5. [Medline]. Gaviani P, Leone M, Mula M, et al. Progression of MRI abnormalities in herpes simplex encephalitis despite clinical improvement: natural history or disease progression?. Neurol Sci. 2004 Jun. 25(2):104-7. [Medline]. Küker W, Nagele T, Schmidt F, Heckl S, Herrlinger U. Diffusion-weighted MRI in herpes simplex encephalitis: a report of three cases. Neuroradiology. 2004 Feb. 46(2):122-5. [Medline]. Ohta K, Funaki M, Tanaka M, Suzuki N. Early cerebellar involvement on diffusion-weighted magnetic resonance images in herpes simplex encephalitis. J Neurol. 1999 Aug. 246(8):736-8. [Medline]. Schmidbauer M, Podreka I, Wimberger D, et al. SPECT and MR imaging in herpes simplex encephalitis. J Comput Assist Tomogr. 1991 Sep-Oct. 15(5):811-5. [Medline]. Tien RD, Felsberg GJ, Osumi AK. Herpesvirus infections of the CNS: MR findings. AJR Am J Roentgenol. 1993 Jul. 161(1):167-76. [Medline]. Provenzale JM, vanLandingham KE, Lewis DV, Mukundan S Jr, White LE. Extrahippocampal involvement in human herpesvirus 6 encephalitis depicted at MR imaging. Radiology. 2008 Dec. 249(3):955-63. [Medline]. Chow FC, Glaser CA, Sheriff H, Xia D, Messenger S, Whitley R, et al. Use of clinical and neuroimaging characteristics to distinguish temporal lobe herpes simplex encephalitis from its mimics. Clin Infect Dis. 2015 May 1. 60 (9):1377-83. [Medline]. Bajaj M, Mody S, Natarajan G. Clinical and neuroimaging findings in neonatal herpes simplex virus infection. J Pediatr. 2014 Aug. 165 (2):404-407.e1. [Medline]. Tan IL, McArthur JC, Venkatesan A, Nath A. Atypical manifestations and poor outcome of herpes simplex encephalitis in the immunocompromised. Neurology. 2012 Nov 20. 79(21):2125-32. [Medline]. [Full Text]. Schleede L, Bueter W, Baumgartner-Sigl S, et al. Pediatric Herpes Simplex Virus Encephalitis: A Retrospective Multicenter Experience. J Child Neurol. 2013 Jan 16. [Medline]. Leonard JR, Moran CJ, Cross DT 3rd, Wippold FJ 2nd, Schlesinger Y, Storch GA. MR imaging of herpes simplex type 1 encephalitis in infants and young children: a separate pattern of findings. AJR Am J Roentgenol. 2000 Jun. 174(6):1651-5. [Medline]. Okanishi T, Yamamoto H, Hosokawa T, Ando N, Nagayama Y, Hashimoto Y, et al. Diffusion-weighted MRI for early diagnosis of neonatal herpes simplex encephalitis. Brain Dev. 2015 Apr. 37 (4):423-31. [Medline]. Sämann PG, Schlegel J, Müller G, Prantl F, Emminger C, Auer DP. Serial proton MR spectroscopy and diffusion imaging findings in HIV-related herpes simplex encephalitis. AJNR Am J Neuroradiol. 2003 Nov-Dec. 24(10):2015-9. [Medline]. Takanashi J, Sugita K, Ishii M, Aoyagi M, Niimi H. Longitudinal MR imaging and proton MR spectroscopy in herpes simplex encephalitis. J Neurol Sci. 1997 Jul. 149(1):99-102. [Medline]. Grydeland H, Walhovd KB, Westlye LT, et al. Amnesia following herpes simplex encephalitis: diffusion-tensor imaging uncovers reduced integrity of normal-appearing white matter. Radiology. 2010 Dec. 257(3):774-81. [Medline]. Vossough A, Zimmerman RA, Bilaniuk LT, Schwartz EM. Imaging findings of neonatal herpes simplex virus type 2 encephalitis. Neuroradiology. 2008 Apr. 50(4):355-66. [Medline].